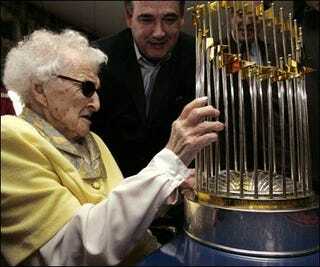 The accompanying photo you find here is of then 110-year-old Red Sox fan Kathryn Gemme doing her best to investigate the World Series trophy after the Sox won in '04 to determine whether it's actually the trophy. Or the bathroom. Or the dishwashing machine. Or President Taft. Anyway, Gemme died at the Nemasket Healthcare Center in Middleborough on Friday at the age of 112. She first went to Fenway Park as a saucy little 18-year-old vixen and still attended Red Sox games until she was 109. Gemme credited her long life and health to simple living. "I didn't drink, didn't smoke, I ate regularly. No fancy stuff," she once told The Enterprise of Brockton. Although her eyesight, hearing and mobility failed, she remained mentally sharp until the end, said Sharon Gosling, Nemasket's activity director. Gemme is survived by her daughter, four grandchildren, seven great grandchildren, and, of course, the 2004 Boston Red Sox.